Rangers manager, Pedro Caixinha, caused controversy towards the tail end of last season when he suggested that the departure of several prominent Aberdeen players represented ‘the end of a cycle’. Derek McInnes was irked by the phrase, which many interpreted as a subtle taunt insinuating that Aberdeen’s time as Celtic’s main competitors had come to its natural conclusion. The Portuguese coach delivers his media dictums in an occasionally jarringly literal form of English, something that can lead to a non-native speaker in a country whose footballing culture oozes cynicism and faux-controversy, suffering the consequences of a trivial comment being taken out of context. At a rudimentary level, even if Caixinha did intentionally hint at unavoidable decline, his words were matter of fact. Inevitably, any club losing its captain, Ryan Jack, and two most influential creators, Jonny Hayes and Niall McGinn, in the same summer constitutes a transition into a new phase. Add to that Ash Taylor, Peter Pawlett and a couple of once promising youngsters, it was looking like a gloomy few months for the Dandies. That was, however, until McInnes rejected Sunderland. Since then he has brought in five first-team players, while renewing Ryan Christie’s loan deal and signing on for another few years himself. After choosing to maintain a settled squad for the last three years, adding only two or three players at a time, a high turnover of players is bound to change the dynamic of Derek McInnes’ group. Sir Alex Ferguson repeatedly stated his belief that there is a limit to the longevity of one group of players and, when you look at the nucleus of the squad last year something had to give. Replacing Hayes and McGinn with two loanees will mean more succession planning next summer, but with contracts expiring and appetites needing whetted it was necessary to refresh the personnel. It remained to be seen whether the blueprint would undergo reconfiguration too, but with just over two weeks until the opening league game it seems probable that, over the course of the season, the new cycle will herald the evolution of Aberdeen’s tried and tested approach. On paper, the signings of Kari Arnason, Greg Tansey, Ryan Christie, Greg Stewart, Gary Mackay-Steven, Nicky Maynard and most probably Shaun Maloney is impressive business, and will be reassuring to the Pittodrie faithful. Individuals don’t make teams though, which is why, as a collective, the profiles of the new batch of Dons represent a departure from the norm in recent years. McInnes dabbled in experimenting with the overall shoe to accommodate James Maddison but the cohesion of the team didn’t suit his game. If McInnes adapts to suit the styles of his midfield acquisitions it could spell the end for Rooney, which may seem harsh considering he has reached twenty goals in each of the past three seasons (only nine were non-penalty goals last season), but his limitations will become evermore accentuated if he continues to spearhead the attack in the same established matrix. Aberdeen, whilst undoubtedly containing some of the league’s most talented players, have built a reputation as a workmanlike side who grind out results by consistently bullying the lesser sides into submission. There is a ceiling to playing so rigidly in Europe though, as Tommy Wright’s St Johnstone found out once again this season. Aberdeen have faltered in Europe predominantly due to a lack of guile. Similar to the dichotomy that has troubled Saints, Aberdeen’s set-up is conducive to overpowering Scottish teams but it doesn’t translate into the European arena quite as effectively. Nevertheless, they have duly marched on to the latter stages of the qualifying rounds consistently, but the late goals suggest this is a result of a war of attrition rather than superiority. This was played out in last week’s first-leg draw with Siroki Brijeg where they lacked width and resorted to playing long to Rooney who, not for the first time, cut an isolated figure. The pragmatic, percentage-play strategy works well away from home, but when at Pittodrie the build-up play is either largely disjointed or muddled. 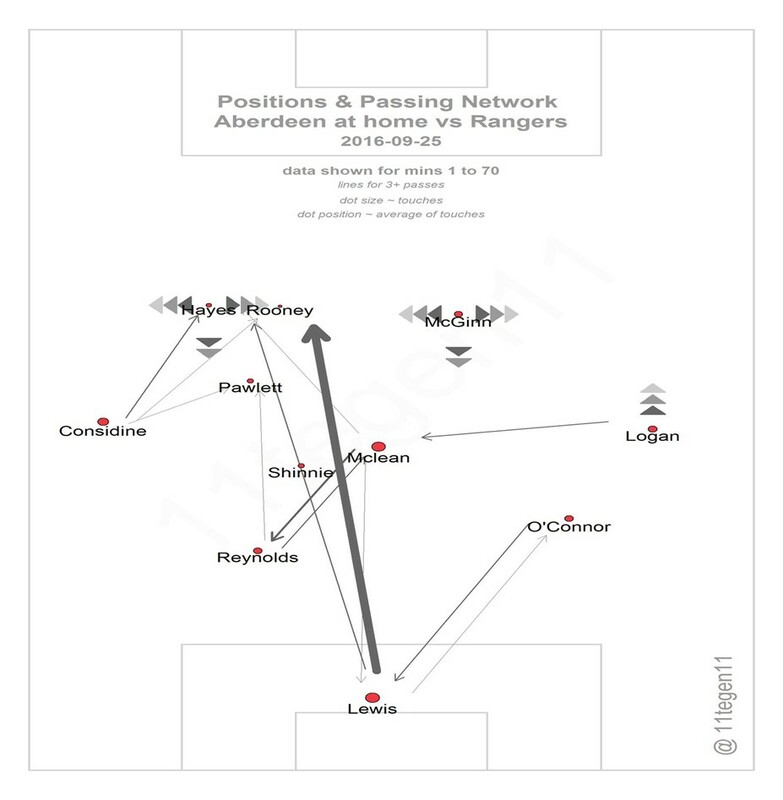 It has not been uncommon for Aberdeen’s most common pass combination to be Joe Lewis straight to Rooney, as this Rangers pass plot demonstrates (courtesy of @11tegen11). This failure to adapt tactically has primarily been due to the lack of diversity in forward areas. Miles Storey offers mobility but has been largely out of the picture since he signed last season, leaving them with only two robust target men in Rooney and Stockley. There are a finite number of ways of playing that are conducive to their strongest attributes. Aberdeen had success against Celtic, courtesy of bypassing the midfield and going long to Stockley who dominated in the air, but, as explored in further detail below, the rough and ready approach may be deemed redundant against the smaller sides in favour of devising a progressive game plan revolving around a mobile forward in order to indulge the creative signings. Any team with Rooney as a focal point is going to struggle to play intricate football in and around the box, which is why wing play has been such a central feature of Aberdeen’s resurgence. Hayes and McGinn have now moved on to pastures new, making it doubly as galling a blow to Aberdeen. Stewart, Christie and GMS (all left-footed) are capable of playing across the three positions behind the lone striker but they don’t instinctively fit into McInnes’ fondness of traditional wing play. Christie prefers to play centrally and gravitate towards the right wing, while the other two also prefer to cut in from the right flank onto their left foot. Aberdeen have relied on the crossing prowess of McGinn and Hayes, but this trio have based their careers on intricate link-up play in pockets of space and the ability to combine in tight spaces. Unlike Hayes and McGinn to whom it was their modus operandi, it is not in their footballing instinct to drive to the line and cross, especially when playing on the inverse wing. That issue is exacerbated by the imbalance of natural left-footers. Only GMS can realistically perform on the left wing, meaning the relationship between winger and full-back may have to change to compensate. Andrew Considine, voted player of the year last season, despite having a great engine, is not a modern full-back in the sense that he offers a viable outlet on the overlap. He is a converted centre-back and it shows in his inconsistent deliveries, which he has a habit (or is more likely instructed to) of lofting from deep. When McGinn played ahead of Considine the left-back would rarely overlap, usually acting as a decoy run allowing McGinn to go inside and cross with his right. More often than not though he held his position and backed Hayes or McGinn to eliminate the full-back alone, deciding that dragging another player with him would only crowd the space. GMS is rapid across the first 5-10 yards but he doesn’t possess the same powerful running ability as Hayes in order to regularly reach the byline, and isn’t as ambidextrous as McGinn to be able to vary his delivery. He relies on underlaps from his full-back to slide balls through to or he drives inwards on most occasions. End of the road for Rooney? The conundrum McInnes’ coaching team are faced with is whether they decide to embrace a game plan based on possession and liberating the three behind the striker, or persist with the same style of wing play even though the actors are used to a slightly different genre. If a team plays with a fluid three-pronged support, the centre-forward needs to have a good perception of space, be comfortable with interchanging positions and able to drift wide to assume other roles. McLean, GMS, Christie and Stewart all thrive on penetrating runs. The much maligned Rooney doesn’t have the skill set to do that. Stockley is arguably a less potent imitation, while Maynard often flatters to deceive but has the pace to ghost past defenders and plays on the shoulder. Ideally, if Aberdeen are able to finance a deal for Louis Moult, the Motherwell striker would be a perfect fit. Equally at home leading the line if it is a physical battle, he drops into pockets to link up with the supporting cast of midfielders, not to mention his lethal streak in front of goal. If the status quo becomes so stale that results and performances force a change to a more expansive system with Stewart, GMS and Christie encouraged to come towards the ball and receive it in the half-space then Aberdeen will need to find the width from the full-backs. This was the problem experienced in both legs against Siroki. Aberdeen struggled to build through the middle meaning that the wide players found it difficult to receive the ball up against an isolated full-back and so drifted inwards. This resulted in Considine and Logan both seeing more of the ball than McInnes would have liked as they were the ones stretching the game. This will not be as much of a problem for Shay Logan as he is adept at crossing the ball in at pace, but committing alternative full-backs higher and wider than they currently venture poses the question of dealing with threatening transitions. Aberdeen are used to having men behind the ball when faced with counter attacks, but will be without Jack who has been the responsible screener up until now. Dons supporters have long implored McInnes to bring in a dominant sitting midfielder. Tansey was finally captured on a free after a controversial attempt a few windows ago, but he likes to roam more and is less vigilant than Jack when it comes to patrolling the space between the lines. With Christie a more natural number ten than McLean, who comes deep to receive the ball and feeds off the scraps from Rooney’s aerial duels, the latter was pushed back into a double pivot alongside Shinnie in the away leg in Bosnia. Shinnie is at his best when he is the primary presser so is not suited to being the deepest midfielder, an aspect of the midfield shape which left McLean’s positional naivety exposed. The new wide additions don’t just change the complexion of Aberdeen as an attacking force, they offer less protection to their respective full-back. They are perceived to be ‘luxury’ players who suit more fluid systems. It’s difficult to contemplate McInnes sacrificing his solid defensive principles by including more than two of the above mentioned together as they could be left exposed on the flanks and in defensive transition. Hayes is a workhorse whose intensity when driving to the line and whipping in a cross is the same as it is when he is tracking back to cover his teammates. McGinn has also been schooled in the art of getting back into a block of five and pressing with aggression. Paul Hartley paid the price for giving Stewart a role on the right-hand side of a 3-5-2 formation, which allowed him to flourish creatively but it was a pyrrhic victory as it led to an imbalanced side overall. He wasn’t comfortable defending as a wing-back but his stint at Birmingham has evidently improved his fitness levels, while the increase in standard demanded he become more tactically responsible in a 4-2-3-1 as he has had to work the channel. GMS isn’t workshy either but their appetite going towards their own goal is markedly less enthusiastic and doesn’t match up to the intensity of two aforementioned cornerstones of recent years. That softening of the industrious core that has defined the squad since 2013 will surely be compensated by the return of Icelandic centre-half Kari Arnason. A fan favourite after a successful spell in the Granite City, his signature renders Ash Taylor’s departure as an even better piece of business, such is the scale of the upgrade. Arnason, who has 60 caps for his country, is superior in every department. Taylor’s most frustrating flaw was his lumbering style with the ball at his feet. Arnason is no Leonardo Bonucci and passing is not his major strength, but Taylor’s rash hoofs upfield were a hindrance when trying to recycle possession. Below, one can see just a few of dozens of examples of a simple ball lobbed over the top of the Aberdeen defence ceding 50 yards in ground to the opponent due to Taylor’s lack of composure. Arnason, meanwhile, played a full season in midfield for Rotherham in the Championship, highlighting his comfort with playing on the deck. Unlike Rangers’ tactic against Aberdeen in their 3-0 victory where they allowed Taylor unopposed possession due to his poor distribution, Arnason is able to drive out of defence with the ball. O’Connor’s distribution is his redeeming feature but the ease with which he is dragged out of position will see Reynolds retain his place, even if he plays direct far too often. Arnason also offers a great threat from set-pieces as seen with the way Iceland utilised his leap in the Euros. Surprisingly, he is actually three inches taller than Taylor who is deceptively only six feet tall, a deception borne out of his ungainly gait. Rooney is also only 5ft 10, which may explain why launching the ball in the air at him relentlessly is a rather futile tactic. If Aberdeen opt to retain the cross-heavy paradigm and try to shoehorn GMS, Stewart, Christie and Maloney into a tactical straitjacket then it is not difficult to foresee some more unimaginative displays at Pittodrie this year. Long-term, McInnes has to identify a centre-forward with more strings to his bow as Rooney’s restrictions have been outweighing his decent goals record for some time now. The malaise has manifested itself in the form of fruitless long balls which, if he does not recognise the need to adapt, may well undermine the excellent work he has performed in securing the calibre of acquisitions he has.